First published on Sky News on 29th May 2010. It is the middle of the night as the men from C Company march down to the Helicopter Landing Site on the Forward Operating Base in Sangin. The last time these boys left camp, they came back without one of their most popular and experienced Royal Marines. As the two Chinooks roar out of the pitch darkness, the tension is palpable. These men mean business – loaded with hundreds of rounds of ammunition, bridging equipment and mine detecting kit, they move swiftly and efficiently onto the aircraft. We’re crammed in, hanging off ceiling straps as the aircraft lurches over the hills just feet from the ground. Then suddenly we’re off the ramp and piling into a huddle on the ground in the hope that our chosen landing spot is clear of IEDs (improvised explosive devices). Mine-detecting kit is deployed and we set off gingerly across the fields. Every marine is quite literally checking his every footstep, staying low and wading through rivers on the way. C Company is heading for a suspected Taliban compound a few hundred metres away. Just last week a local teenager struck up a friendly conversation with a passing patrol here. Having identified the commander, he ambled off to collect his suicide vest from a neighbouring compound. He then walked back over to his new ‘friends’ and blew himself up. The young Taliban recruit failed to take anyone else with him on his suicide mission, but C Company know there are more where he came from. 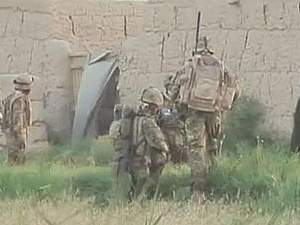 Assisted by soldiers from 1 Scots, the marines watch over the Afghan National Army as they clear through a series of compounds and question locals. And all of this in the face of an intensely frustrating challenge – “courageous restraint” dictated by their rules of engagement. This means using as little force as possible, sometimes staring an insurgent in the face and letting him walk away. The idea is to protect the surrounding local population, win them over, and strip the Taliban of support. But when your best mate has just been killed by an IED set by an enemy who doesn’t play by the rules, that’s a very big ask. Today the mission was a success; the Royal Marines with the men from 1 Scots put “boots on the ground”, disrupted Taliban activity and reassured the local population. But most importantly for the Marines from C Company, everyone came back. Safely on the ground, Troop Sergeant ‘Smudge’ Smith gathers his boys into a huddle. As every man remembers the mate and colleague they’ve lost, he tells them how proud he is of them. They’ve held it together and teamwork has got them through a horrific couple of days. They’ve got a job to do and giving their friend a proper send-off will have to wait until they get home. This entry was posted in Afghanistan and tagged 2 Scots, 40 Royal Marines Commando, Afghan National Army, Afghanistan, Afghans, Army, Bastion, British Army, BSKYB, C Company, Commando, Helmand, Helmand Province, IED, mission, raid, Royal Marines, Sangin, Taliban. Bookmark the permalink.